France's Olivier Giroud, center, goes down after a header during the group C match between Denmark and France at the 2018 soccer World Cup at Luzhniki Stadium in Moscow on Tuesday. The teams played to a scoreless tie — the tournament's first. 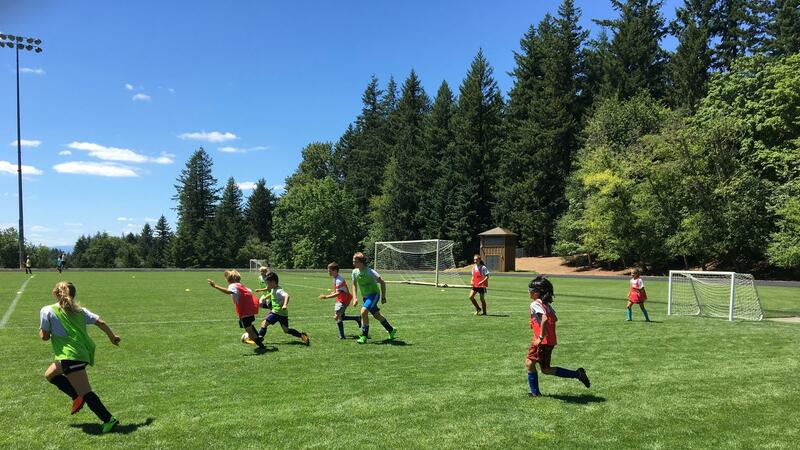 Children at the Bernie Fagan Soccer Camp in Portland, Ore., where soccer's next generation had their own opinions about Tuesday's double goose eggs at the World Cup. Few in Moscow celebrated this record however. Those inside Luzhniki Stadium described a crowd reaction ranging from disappointed to сердитый. Which, in Russian, means angry, grumpy, irate, cross, gruff, surly ... or all of the above. Irish Independent Football Correspondent Daniel McDonnell tweeted, "Danish fans trying and failing to sing over chorus of boos from angry Russians. Imagine spending your hard earned on getting one World Cup ticket and ending up with this rubbish." Added Stuart James of The Guardian, "Match 37, to give the fixture its official FIFA title, ended goalless and was played out to a soundtrack of whistles and rumbling of discontent, followed by loud boos at the final whistle." It was a sluggish match with minimal attacking and few if any scoring chances. There was a lot of kicking the ball around midfield, and Danish players mostly hung back to play defense. Denmark needed only a tie, scoreless or otherwise, to stay alive in the tournament and qualify as one of the final 16 teams in the knockout stage. France already had qualified. Essentially, not much reason to play the kind of exciting football that's been a hallmark of this up-to-now successful and engaging World Cup. So the discontent really appeared less about the scoreboard, and more about the action — or lack thereof — on the pitch. And this is an important point. Because soccer fans, real soccer fans, will tell you there's absolutely nothing wrong with a nil-nil draw. It's all about how you get there. "Some of the best matches I've seen have been nil-nil draws," says Jules Boykoff, a former professional soccer player and current professor at Pacific University in Forest Grove, Ore. "They can be nailbiters," he says, "they can provide all sorts of goal scoring opportunities that just aren't converted. Maybe there's some spectacular goal keeping [preventing the opponent from scoring]." In nearby Portland, a soccer hotbed, it's not surprising to hear similar sentiments, even from a next generation of soccer lovers. On a sunny Tuesday at the city's Bernie Fagan Soccer Camp, 9-year-old Zeeshan Faruqi said scoreless draws both are fun, and not fun. "[When] nobody scores, it's kind of sad," he said. "But I know a lot of the teams that get scoreless draws are both really good so they're going their hardest. And if you have a good team normally you have a good goalie and the goalie's just saving all of the shots." Standing on a lush green field at the camp, Ju-ju Madden, who's the same age, offered a decidedly different 9-year-old take on scoreless draws. "I like nil-nil scores because all the player's faces are like..." he said, scrunching up his face, "all the players look really sad. It's kind of funny to me." It may be soccer-friendly Portland, but this is still the U.S., where the allure of high-scoring sports like basketball make a nil-nil draw seem, well, pathetic. Camp participant Charlie Broad, 10, isn't that harsh. But he definitely says "no" to nil-nil. "I don't like scoreless draws because it's not very fun for me," Broad said at the end of his soccer day. "Like, I liked England beating Panama 6-1 because I like [English star and current top goal scorer in Russia] Harry Kane. He's my favorite player. I like watching goals happen. I don't like no goals." Which means Charlie Broad has been pretty happy during this World Cup of only one [so far] nil-nil draw. Former professional player Jules Boykoff says the lack of scoreless ties could be tied to technology. "VAR may be a factor," Boykoff says about the first-time World Cup use of the Video Assistant Referee. Boykoff says the use of video reviews may be leading to more scoring. "There have been a bundle of penalty kicks awarded this tournament," he says, adding, "Referees calling penalties is a huge deal, so in the past they'd want to be extra sure a foul, indeed, occurred in the box so as not to produce a mis-call. Now they have VAR as a sort of alibi and as a way to go back and award penalties that in years past might've just passed quietly into history as non-calls." 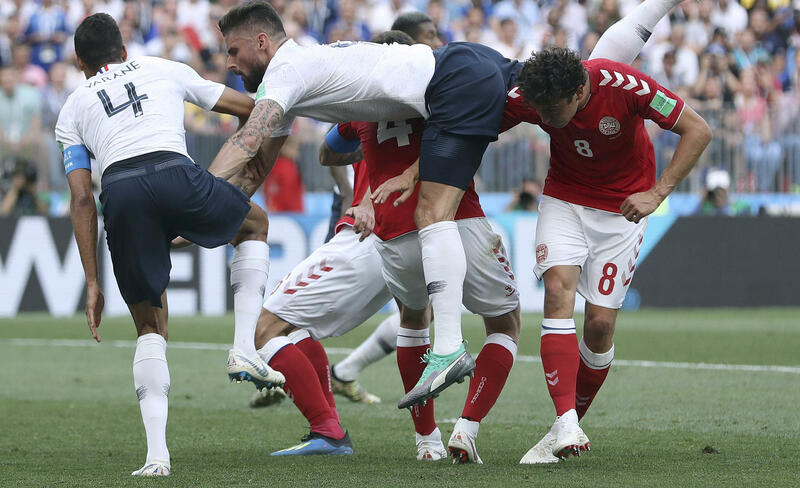 Boykoff says the plodding, Denmark-France zero-zero draw, makes it more challenging for soccer lovers in the U.S. to convert soccer non-believers. But with the scoreless ties being a relative rarity in Russia, and the technology perhaps guaranteeing that into the future, more people in the U.S. may have, in fact, converted by the time the World Cup comes to North America in 2026. And converted to such an extent, that an occasional nil-nil outcome is not as bad as it seems.